It’s been raining for three straight days in Atlanta. I’m pretty sure it’s been overcast for a full week. While I don’t miss the frozen, snowy winters of Wisconsin, I have to admit a winter buried in snow is at least bright and pretty; as opposed to a winter running to and from your car under a grey sky. I think I’ve even lost track of day time and night time at this point. Oh yeah, and apparently we’re all going to get the flu and die. Wooo! Happy 2013! You know what’s going to cheer you up? 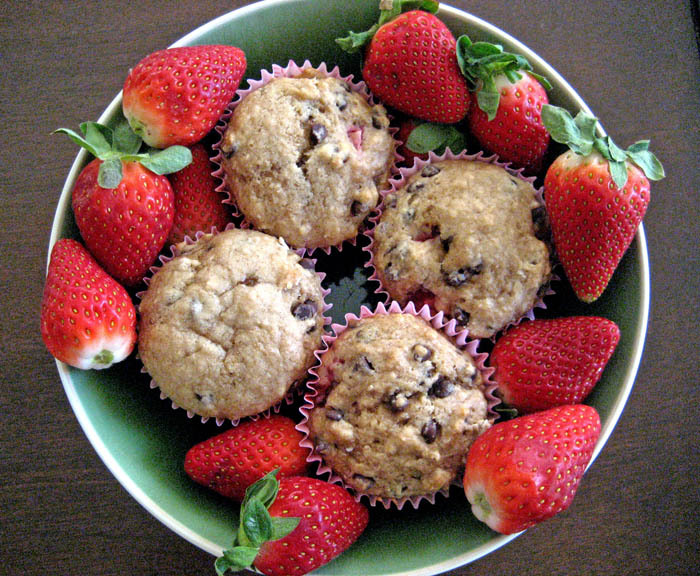 Strawberry chocolate chip muffins. Oh heck yes. I know it’s winter and strawberries aren’t in season and that makes me the enemy of locavores everywhere, but I needed something to remind me that spring would be here eventually. And duh, it needs to have chocolate in it too. If your frown still isn’t upside down on this one because you’re sticking with your New Year’s resolutions and you’re like “Damnit Red! I can’t be eating muffins right now!” then let me rock your world : these babies are only 140 calories each. Crikey! You could eat two! Plus, strawberries are high in vitamin C which will help defend you from the evil flu. This recipe comes from Sally’s Baking Addiction. Sally rocks my world because she’s always combining my favorite flavors into muffins, bars, cookies, donuts and cupcakes. I think my blood sugar spikes just by visiting her site. If that’s not a ringing endorsement, I don’t know what is! Now wipe the drool off your face, go to the store, buy some strawberries, tell the food co-op hippie to stop judging you, and make a batch of muffins. Reclaim the karma of buying off-season fruit shipped in from South America by selflessly sharing your muffin bounty. Preheat oven to 350F degrees. Either spray 10 muffin tins with nonstick cooking spray or use muffin liners and give each liner a quick spritz of cooking spray (because these don’t have oil, they really stick to the wrapper and the cooking spray will help). Set aside. In a large bowl, gently mix the flour, baking soda, and cinnamon. Set aside. In a separate bowl, mix the brown sugar, granulated sugar, and applesauce together until no brown sugar lumps remain – a fork works well to break up the brown sugar here. Add the beaten egg white until fully incorporated. Add the wet ingredients to the dry until just combined (remember, don’t over mix – it’s the secret to soft muffins and bread). Fold in the strawberries and chocolate chips. Pour the batter into 10 muffin tins. Bake for 15-20 minutes. Muffins will be lightly golden in color and a toothpick inserted in the middle should come out clean. Allow muffins to cool and dive in. 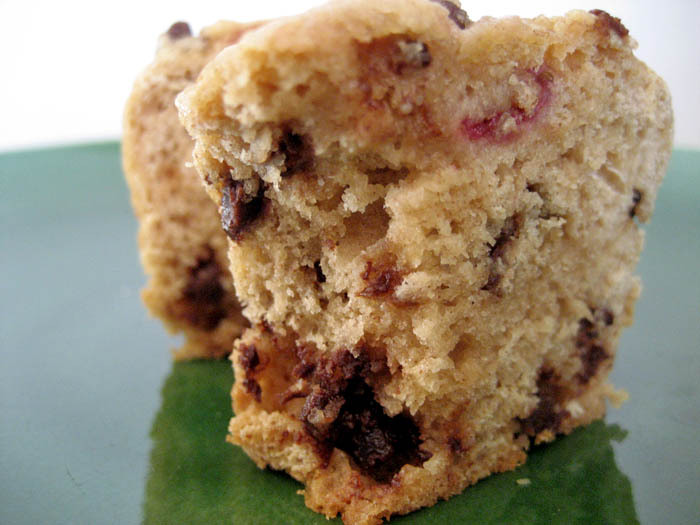 Muffins stay fresh in an airtight container at room temperature for 7 days. Muffins can be frozen. 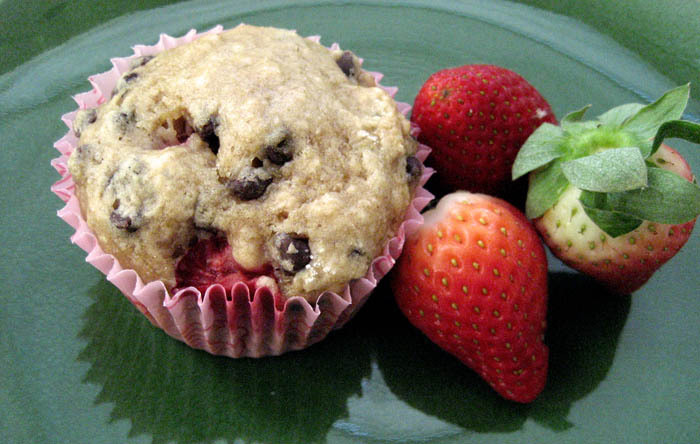 I’ve never heard of strawberries in a muffin before, but I’m liking it! I’m always trying to healthify my muffins too. Sounds delicious! They are awesome. And if you have leftover strawberries you can cut them up and freeze them for smoothies later! These look ahhhmazing! Good job! Thank you! You should try them, they are so easy!